The Blakes Golf Club is an inland links golf course with some lovely holes and a great finale - a long uphill par 5 over water. It's true it's currently very new, immature and open but it will look and play brilliantly in a few years' time. Watch out for the par 3 8th, a replica of the island green 17th at Sawgrass. 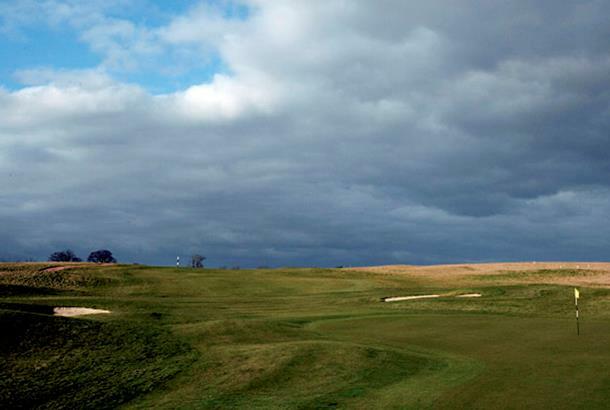 The Blakes Championship golf course, designed by Howard Swan, is a very young course that has not been around for a long time at all, and is best described as an inland links. The layout and undulations of the golf course are totally unique to the area with rolling fairways and sleepered bunkers giving the feel of a traditional seaside links. In addition, a unique drainage system involving a grid work of gully pots positioned on all fairways, USGA standard sand-based tees and greens enable the golf course to be playable all year round. Accommodation: A Travel Lodge is just a wedge away and there's also a Holiday Inn in Harlow. Green Fees Mon-Fri: £16. Sat-Sun: £20 (between 7.30am and 12pm)/ £15 (before 7.30am and after 12pm). Having ventured into Essex to play here, purely due to its proximity to the M11 and Stansted, I found "Blakes" to be a real find. In probably some of the worst weather of the Summer, playing here made me almost ignore how foul it was. A real inland links feel and watch out for cars as the access road goes right through a couple of holes. Check for deals. We played a three ball around 2 o'clock on a Saturday (booked five days in advance) and they charged us a straight £20 each for the round. I first played blakes on society day 3 years ago.It was newly opened,I was still impressed and thought that a few years time it will be superb! Well a few years have passed and our society went back in june 2007 and what a difference!! The already excellent greens are even better, The rough has been left to grow and now it looks like a real links course. As its only 10 min drive from home I decided to join and have not looked back since, My golf has imroved due to the type of shots that you have to manufacture on an open windy course, The 120yd island 8th still has not claimed even 1 of my golf balls (more luck than skill)and would recommend anybody who fancies a change/challenge to give it a go! A good links alternative if you don't live near the coast. Some excellent holes, including 120 yard island green, but also some bland ones on the opening nine. Greens are absolutely first rate, large & subtlely contoured. Plenty of signage & distance makers for 200, 150 & 100 yards. Good clubhouse house with friendly helpful staff.